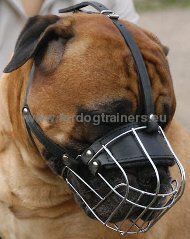 Get a 10% discount today for your purchases with Coupon Code 7757! 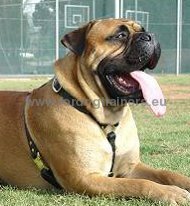 Bullmastiff was created at the beginning of the XIXth century by crossing between Mastiff, big and heavy, and Old English Bulldog, loyal and active. 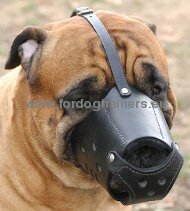 It was then the dog of the gamekeepers; he was later used as police dog. 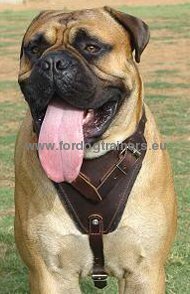 The construction of Bullmastiff's body is powerful but harmonious in its forms, he gives impression of strength without heaviness. He has got a strong square head, his body is compact. His hair is short with dense undercoat. 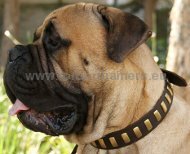 His weight varies from about forty to about sixty kilos. 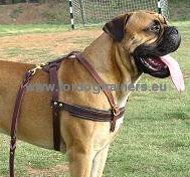 It is a powerful, enduring and active dog, which is at the same time very gentle with children and sociable, even with the foreigners. 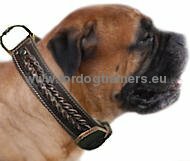 Our online shop of Fordogtrainers presents a wide range of products created just for your strong Bullmastiff - luxurious leather collars, harnesses, muzzles of different types. 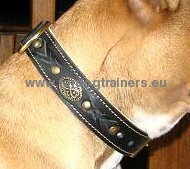 All the products are of high quality, made from the best materials; our specialists adapted them to the physiological specifities of this strong and active dog. 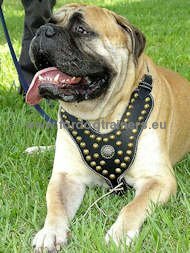 If you have Bullmastiff, you are going to find products deserving your dear loyal friend. 1. 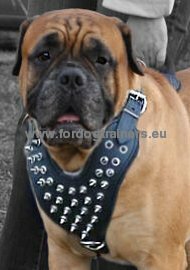 I received this collar and it is very beautiful, very well adjusted for my Bullmastiff and I'll advertize this wonderful site to all the Bullmastiff owners or those who have large dogs and are looking for exceptional products for them. 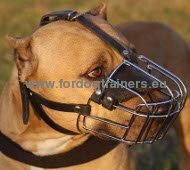 Be sure I'm very happy because of such great quality article and your service. It was the true pleasure to deal with you. 2. 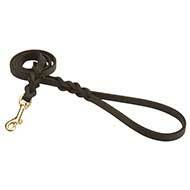 The leash is great - I'm pleased with all its aspects. 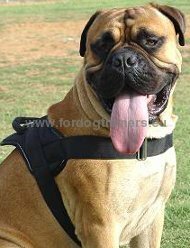 We use the leash for our 50 kilos Bullmastiff puppy. 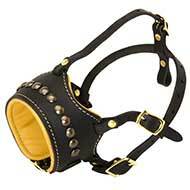 Frankly speaking I thoght the leash would be wider...that's why can't put 5 stars, nevertheless, really high-quality product.